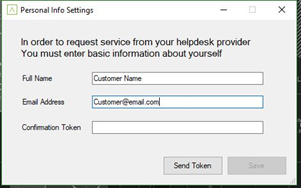 The Helpdesk Agent is an enhanced agent that allows a customer to very quickly create a ticket with a hotkey shortcut or within the Customer Portal; the created ticket includes a screen capture. Once the Helpdesk Agent has been activated, the customers will need to authenticate the Helpdesk Agent (for the purpose of identity confirmation). 2. Then click on the Device / Agent. The Agent Page displays. Note: Customers will need to authenticate the Helpdesk Agent before they can open a ticket for the first time (one-time only). See below for instructions. 2. Fill in your full name and email address, and click Send Token. A token will be emailed to you (for purposes of identity confirmation). 3. 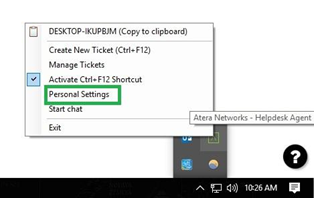 Check your email to obtain the confirmation token, then enter it into the Confirmation Token box on the Personal Settings screen, and click Save. You can now open tickets and utilize all the features of the Customer Portal.